FRENCH BREAD - Our classic Sourdough Bread. ORGANIC WHOLE WHEAT - A wheat bread made with 50% organic whole wheat flour and 50% unbleached, unbromated wheat flour. SIX GRAIN - A crunchy grain bread with the crunch of Cracked Wheat, Barley, Millet, Cracked Oats, Corn Meal, Rye Meal and Flax Seeds. Lots of fiber! DELI RYE - A unique tasting rye bread with caraway seeds made from sourdough starter. HONEY WHOLE WHEAT - A light whole wheat bread using our organic flour with the addition of clover honey. BATARD- A small sourdough French Loaf, light and airy, crusty and lots of flavor! EASTER BREAD - A delicious Easter Bread (Paska) made with golden raisins. IRISH SODA BREAD - A sweet dough made with golden raisins and baking soda instead of yeast for a cake like texture. CHRISTMAS STOLLEN - Stollen is a fruitcake type bread that originated in Germany. It is made with yeast, water and flour, dried cherries, citrus peel, golden raisins, walnuts, and Christmas spices; the dough is quite low in sugar and VERY TASTY!!! JALAPENO CHEDDAR - Our white bread with cheddar cheese folded into the loaves and sliced jalapeno’s. It’s hot! CALAMATA OLIVE BREAD - Our classic white dough with Greek Kalamata olives added for exceptional flavor. CHALLAH - An Egg Bread with a delightfully unforgettable flavor. Makes delicious French Toast. SANDWICH BUNS - Perfect size for a hamburger, made with 20% organic whole wheat flour. PULL APART DINNER ROLLS - Mouth watering, great tasting pull apart rolls made with 20% organic whole wheat flour. RAISIN BREAD - A tasty bread made with Quaker Oats, California raisins and a touch of cinnamon. 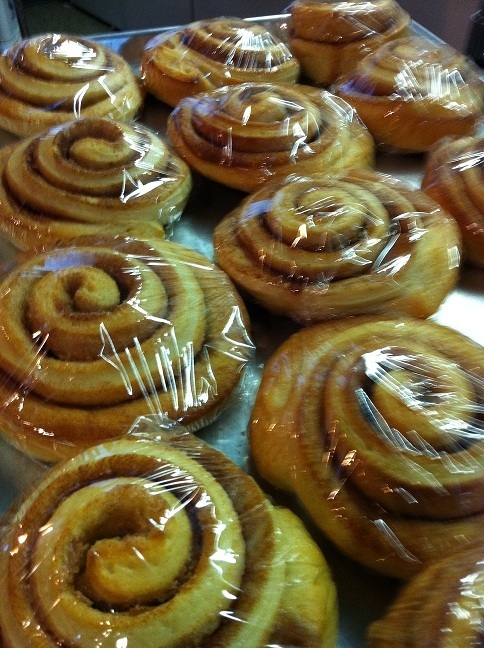 CINNAMON ROLLS - Made daily from scratch, our sweet dough with cinnamon and sugar rolled inside.